25 years have passed since March 12 1989, the day in which a British computer scientist called Tim Berners-Lee wrote a proposal concerning the management of information about experiments made at CERN, the European Organization for Nuclear Research. The main innovation in this proposal, that would become the World Wide Web, was the use of the hypertext, an already existing idea that consisted of a special kind of text that makes reference to another document, providing immediate access to it. It was not until December 20 1990 that the first web page was ready to be accessed. The server that hosted that page was a NeXT computer, NeXT being the company created by Steve Jobs once he was fired from Apple during the 1980s. On 1991, December 12, the first web server outside Europe started working, and on April 30 1993 CERN put the World Wide Web software in the public domain, releasing its source code. 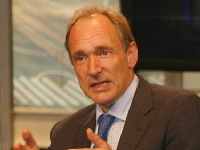 Later, on October 1 1994, Tim Berners-Lee founded the World Wide Web Consortium (W3C), an international community to develop Web standards with the mission of leading the Web to its full potential. Since that day the W3C remains the main standards organization for the World Wide Web. By ROM Cartridge. Image courtesy of Wikimedia Commons.